switch off the flame. 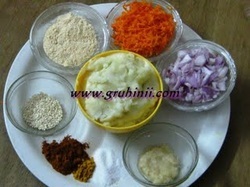 Add finely chopped coriander to it. Boil potatoes, peal and mash thoroughly. Add salt to taste and keep it aside. Now take a small lemon size ball of the mashed potato. Flatten it. 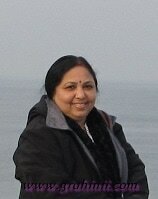 (you can see in the pic. 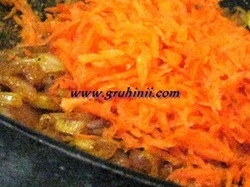 above) Fill the carrot mixture in it. Now cover it with another flattened potato ball. Seal it properly.See that the filling do not come out. 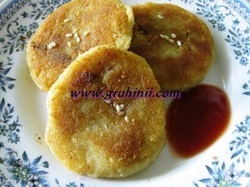 Make cutlets in the same manner. Take 2 tbsp corn flour in a bowl, add water and make thin batter. 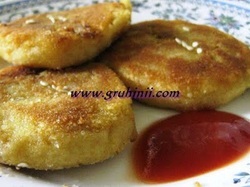 Dip the cutlets in the batter dust them with the bread crumbs and sprinkle sesame seeds on it. Heat a pan and place the cutlets in it. 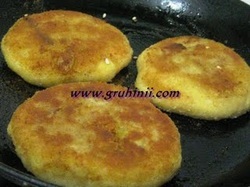 Add some oil around and shallow fry the cutlets in a medium flame until golden brown on both the sides. 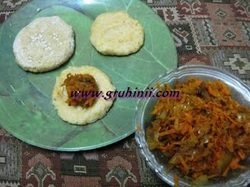 Tasty Carrot cutlets are ready to serve.Serve hot with Sauce or any green chutney. Enjoy.